In the present article, the authors analyze archival data from the internal magazine La Revue Desjardins of the Desjardins Group over the 80 years of its publication from 1935 to 2015. The authors examine the ways in which the “founder figure” (deceased in 1920) is used over time and at critical junctures in the organization’s life to reformulate, maintain, strengthen, or revise organizational identity and to legitimize or potentially constrain organizational renewal. Drawing on the notion of “presentification” from communication theory, the authors identify two modes of evocation and five modes of invocation that describe the ways in which the founder is “made present” to accomplish different purposes. The article also shows how these modes become operative during major change periods. 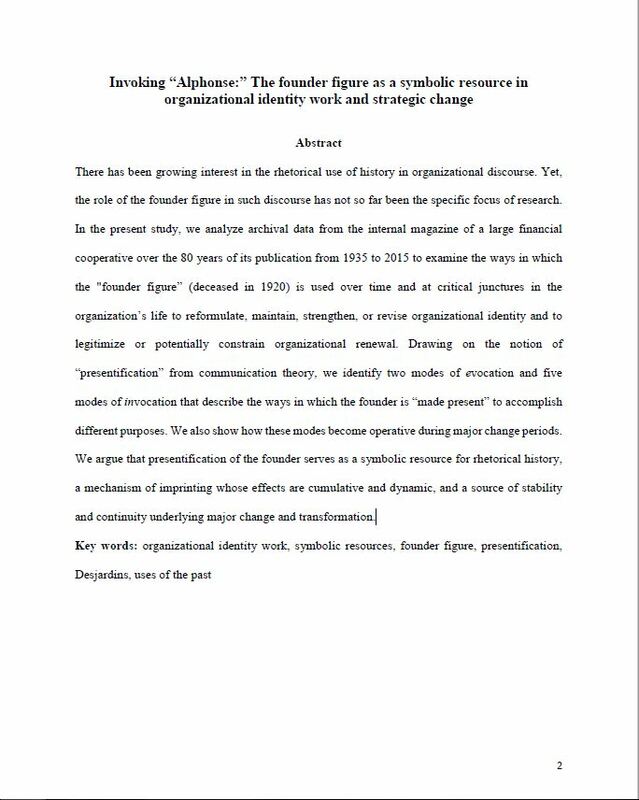 The article argues that presentification of the founder serves as a symbolic resource for rhetorical history, a mechanism of imprinting whose effects are cumulative and dynamic, and a source of stability and continuity underlying major change and transformation.